But we know why you’re really here: Charlotte is where people go to raise babies. There’s tons to do and a lot of obvious choices (Discovery Place Kids, Imaginon, Ray’s Splash Planet), but even more exciting are the hidden gems. 1. Radcliffe on the Green Sprayground & Park – Park in the garage underneath the Ratcliffe condominiums. Pop over to Fuel Pizza and get some slices to-go. Grab a shady spot for a picnic. Let the kiddos romp in the beautiful park. Then cool off at the sprayground with the spitting fish. Life is good. 2. Mint Museum – Admission is free on Tuesday evenings, but whenever you go, be sure to ask about all of the special games and activities for the children to do throughout the museum. It’s awesome. 3. Go Geo-Caching – There are hundreds of these treasures to find in Charlotte and your kids will love discovering them! It's a great way to sneak in exercise, and is as much fun for grown-ups as it is for kids. 4. Lazy 5 Ranch – Looking for a place where the wild animals (and I don't mean the kiddos!) roam free? They offer a 3.5 mile safari ride by car or guided wagon to view over 750 animals from 6 continents. It was a wonderfully “slobbery” situation. 5. Explore with Your Jogging Stroller – There are some incredible greenways in Charlotte. From exploring sky scrapers to boardwalks through marshes, this is the best way to explore the city! 6. Open Play at Superior Play Systems – If running your kids out of energy is your modus operandi, then Superior Play Systems is your place. Between the hours of 10 am and 1 pm on Wednesdays and Fridays, their sales floor is your giant indoor playground and even better ¦ it's free!! 7. Summer Camps and classes at Small Hands Big Art – I hate messes and crafts and messy crafts, which is why we go to Small Hands Big Art, where they manage all of this for me. Relatives tell me how much they love his art as gifts. I love that I don't have to keep paint brushes in the house. 8. Indoor Play Area at Carolina Place Mall – This is the place to take your kid when they are learning to walk. The floor is padded, and they have age-appropriate, soft crawling features for the little ones to pull up on. Avoid this place when school is out (no baby enjoys being trampled by a six-year-old)! 9. Atherton Mills Farmers Market – Located in the heart of Charlotte's historic South End District, this Farmers Market features a lively mix of retailers and a high quality Urban Market. On weekends there’s an arts and crafts table, a balloon maker guy and a breakfast food truck. Win-win! 10. Bocce Ball Courts – Check out the Sugar Creek Greenway Bocce Courts. BYOB. Bring your own Bocce. So there’s that, but there’s also a fantastic view of downtown, a little cafe on the greenway with restrooms, and a great time ahead! So, with only ten options and one of the most family friendly cites around I had to leave a lot of favorites out. Learn about more Charlotte must-sees at Mom Favorites. 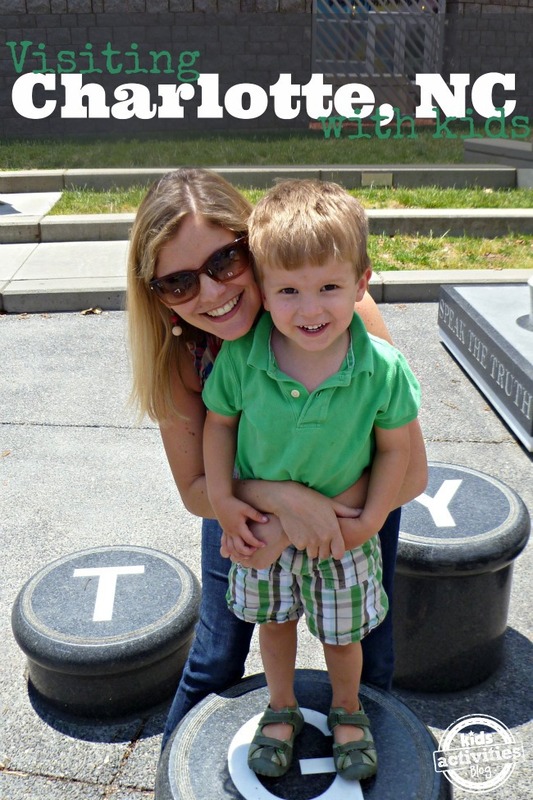 As a work at home mom in Charlotte, NC, Katie Harding stays busy. Her two boys (ages 2 and 5), husband, and pup give her great fodder for her blog, MomFavorites.com where she shares advice, recipes and laughs for the mom-set. Don't forget to check her out on Google+ too! There is also Discovery Place and Discovery Place Kids!! So true, and those are great suggestions! My boys love the Tot Room and Jellyfish tank at DP! We go to Sky High a lot during the summer and even school year!! I’m surprised its not mentioned here. The kids love it! Bouncy walls everywhere. I have been to Sky High too! Sky High is so much fun. My kids love it! I am new to NC and finding this has been such a gem! Thank you, I have 4 kids and being in a new area I have had a hard time knowing what to do, but this is just great. I am really excited to check this out with my littles!